For many patients who lose teeth these days, the effects of their tooth loss don’t have as much of an impact on their quality of life as it used to. That’s largely thanks to innovative benefits of modern dental implants, which provide lifelike support for your replacement teeth in addition to restoring the functions of lost teeth roots. By replacing lost teeth with one or more implant posts, you can enjoy a sturdier and more comfortable prosthesis while improving your ability to preserve the rest of your smile for life. However, before recommending them, we’ll perform a comprehensive exam at our Encinitas/San Diego periodontal office to ensure that you qualify for dental implants. The beauty of dental implants is that they do more than other options to fully restore your smile following tooth loss. Unlike traditional bridges and dentures, those that rest on dental implants are supported by a series of root-like posts rather than hidden clasps, abutment teeth, or adhesives. Because of their ability to replace lost teeth roots, dental implants are often the best tooth replacement option. Yet, that’s only true if your supportive jawbone structure, periodontal tissues, and more are healthy enough to support them. Otherwise, your implants may not be able to save your smile in the long run. Ensuring that your gums are healthy is one of the most important aspects of qualifying for dental implants. That’s because severe gum disease is the leading cause of adult tooth loss, and many patients have to address it before they can address replacing their lost teeth. The reason gum disease is so destructive is because the mechanisms behind it (mainly, oral bacteria) cause rampant inflammation and damage to your gums, periodontal ligaments, and jawbone structure. If not checked, it can continue this destruction even after your dental implant posts are placed, which can compromise the support that the implants need to remain strong and sturdy. 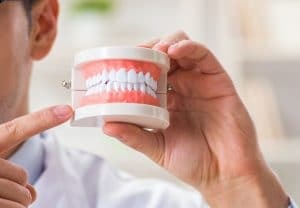 Whether it’s due to severe gum disease or the prolonged absence of one or more teeth roots, your jawbone may have changed shape slightly since you’ve lost teeth. This occurs when your jawbone is no longer stimulated as much because of its missing teeth roots. Over time, your body sends fewer nutrients to your jawbone, causing it to lose mass, density, and strength. As it does so, it becomes less able to support your remaining healthy, natural teeth, much less the addition of one or more dental implant posts. Dental implants can be the best tooth replacement option for most patients, but before recommending them, we’ll perform a comprehensive examination to ensure that you qualify for them. For more information, schedule a consultation with Dr. Kania by calling her periodontal office in Encinitas/San Diego, CA, at (760) 642-0711.